4 Pics 1 Word game, Make your own to use in the classroom! After watching the whole of my tutor group playing 4 Pics 1 word app on their iPhones and iPods and getting very enthusiastic about finding out the answer I decided to try and use the concept of the game in one of my lessons. For those of you that do not know the app, it is a very basic app but has become very popular with my students. Basically, 4 pics are displayed and the player must link them all with one word. Easy! 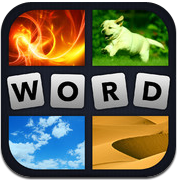 I decided to trial this idea with a Year 8 group that love using iPads and love playing the 4 Pics 1 Word app. The lesson was looking at the properties of metals and one of the objectives focused on learning new key terms. I challenged the students to make there own 4 Pics 1 Word game using Comic Life app. Students chose a keyword that described the properties of metals and produced some excellent game cards. Some example can be seen below. These could be used to aid recall of the meaning of kewwords and we will be using these as a starter activity for the next lesson.